You would think that if you were a public figure who was exposed for being banned from the local mall because you were hitting on young girls and accused of inappropriately touching a 14 year-old, you would do everything to distract attention from those stories. But then, you wouldn’t be failed Senate candidate and full-time homophobe Roy Moore. In a move that is at once brazen and bizarre, Moore is fundraising off the Pulitzer prize awarded to the Washington Post for bringing his sordid habits to light. In fact, he had the plea for money out within 24 hours of the Pulitzer’s announcement. In fact, what Moore is being sued for is defamation by Leigh Corfman. 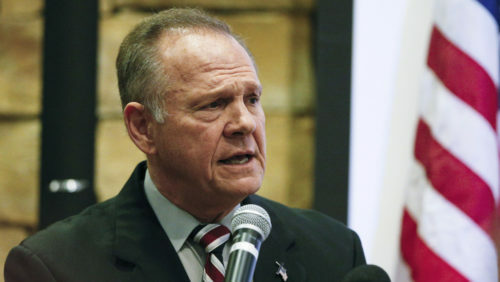 Corfman said that Moore undressed her and touched her sexually when she was 14. Moore said the claim was fictitious and politically motivated, which Corfman alleges defamed her character. Of course, Moore loves to play the victimhood violin when he’s trawling for money. Throughout his campaign, he regularly used the allegations against him for fundraising purposes, charging that the liberal, secular universe was out to get him. Since his election loss in November, Moore has only ratcheted up the rhetoric that he was targeted for being, well, Roy Moore–a homophobic law-breaker standing up for folks just like him. It’s the engine of Moore’s fundraising machine. Too bad for Moore that it’s also a reminder of all the creepy things from his past that have come back to haunt him.